We’Moon: Gaia Rhythms for Womyn, the iconic astrological datebook, is a best-selling moon calendar, earth-spirited handbook in natural rhythms­­, and visionary collection of women’s creative work, now in its 37th year of publication. New this year: We’Moon is now available in Spanish! We’Moon 2018: La Luna calls on the Moon to enlighten us in these clouded times. Transformation is Her specialty! We invoke the Moon’s powers of re-direction for a fragile planet, for troubled peoples, and for all who seek new guidance. La Luna’s dance with Light and Dark, Birth and Death, growth and demise is a pageant of regenerative hope. Her rhythms stir our life-blood, and her cycles reflect the hidden layers of our body-mind wisdom. We’Moon accompanies us through the rhythms of earth and sky that pulse through our lives. The datebook presents a comprehensive introduction to astrology; to Sun, Moon, and Earth cycles; and seasonal Holy Days. We explore the 13 moons of our lunar year in a week-at-a-glance format with daily astrological aspects alongside moon phases and signs. In addition, we include astrological insights for each sun sign, month and year-at-a-glance calendars, a complete ephemeris table for the year and blank pages for notes. We’Moon 2018 Astrologers—The Sky Priestess–Dr. Bairavee Balasubramaniam, Gretchen Lawlor, Heather Roan Robbins, Sandra Pastorius, Beate Metz, Susan Levitt, and Mooncat!—offer clarifying articles about cosmic events and how they may affect our opportunities and challenges in the year ahead. We’Moon 2018 reflects art by contemporary artists including Denise Kester, Amara Hollow Bones, Shelly Anne Tipton Irish, Kimberly Webber, Olivia Jane, and Autumn Skye. Inspired writings that light up the pages from Stephanie A. Sellers, Ann Filemyr, Nell Aurelia, Nuit Moore, Starr Goode, and Naima Penniman along with many other gifted writers! 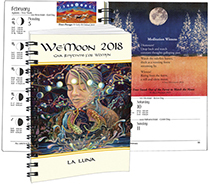 For more information on this 2018 We’Moon La Luna datebook, calendar, and related material, please see the display ad on this page 23 of the 23.4 November/December issue of the WHOLifE Journal and visit www.wemoon.ws.